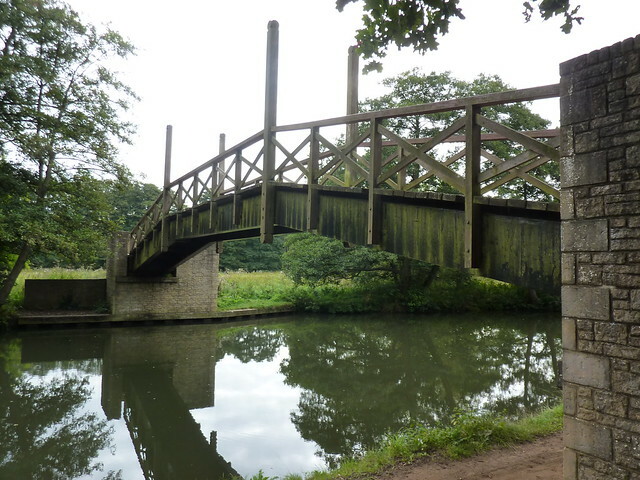 Just under a week later, I was back at Guildford which was notably different to my previous visit. The parks were empty bar a few joggers. The sun wasn’t out. And what few people were wandering around at 9:30am had large cups of coffee held tightly by weary hands. Back down on the banks of River Wey a handful of dog walkers were out stretching their legs as I made my way over the rover and into the small park on the other side. Given the size of the town, it’s rather surprising that it doesn’t take long for the North Downs Way to actually leave Guildford and I was soon walking down a bumpy earth track on the edge of a large piece of woodland, moving off it only once to let past a large HGV which didn’t seem to fit on the road at all, and whose destination I could only guess about. A mile or so on, I walked by a farm where the HGV had managed to park up to deliver its load, but it must have been one seriously bumpy ride to get there. A short climb later and I was stood at St Martha’s Church, which sits surrounded by trees on St Martha’s Hill. The hill was once the site of a medieval fair attended by both pilgrims and the good people of Guildford, and the green track of the North Downs Way that I followed would once have been a busy route used for those on foot and horseback. These days the traffic has gone. 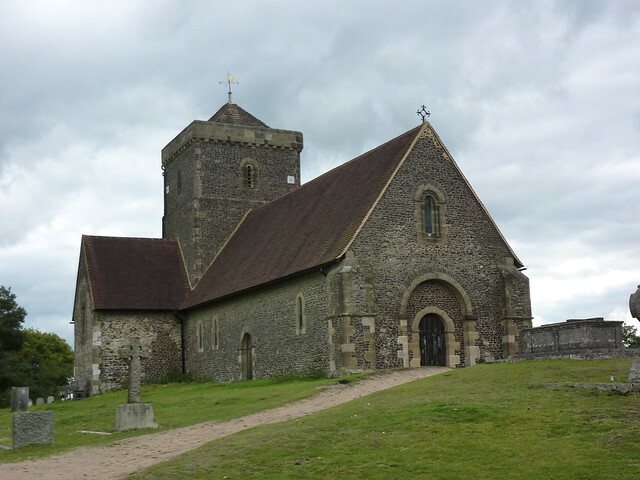 Motor vehicles have been sent elsewhere, the church accessible only on foot and requiring a stiff walk for those in nearby Chilworth who wish to worship there on a Sunday. And so, during the rest of the week little St Martha’s sits in peace and quiet; a tranquil location to stop and reflect as well as to admire the views. The hill was covered in sand and the local flora and fauna stood out brilliant against its light brown colour. 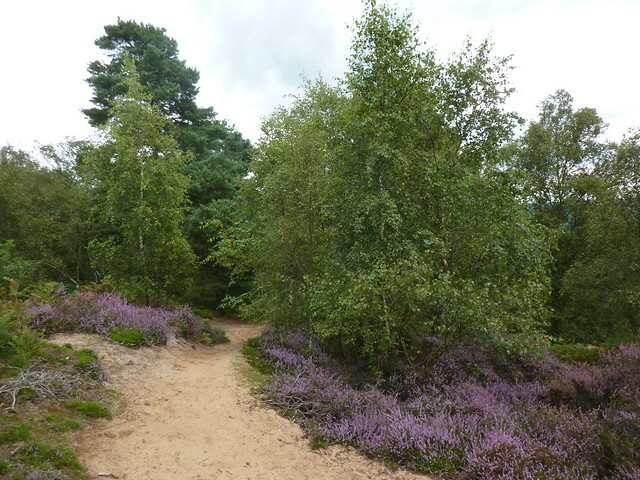 Lined with ferns and heather blooming bright purple flowers, it was beautiful to walk along and the kind of path that puts the walker in a fine spirit. Leaving the woods the path took me up to a small ridge on the Albury Downs, again providing more viewpoints looking south towards the South Downs. The views were to be short-lived as the North Downs Way plunged once more in to woodland that would dominate the rest of the days walking. 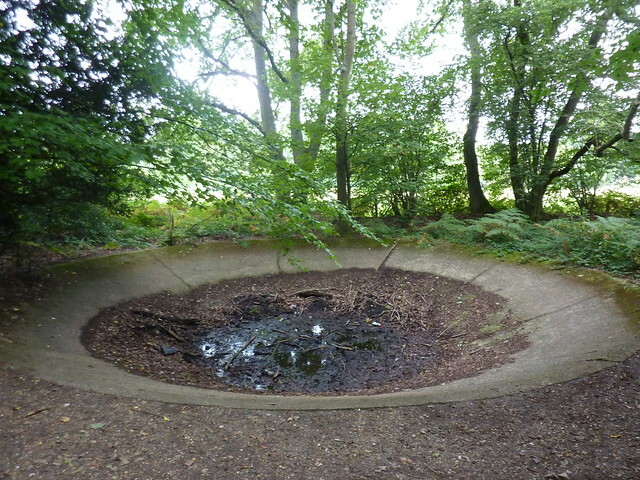 With no panoramic views to admire, attention was naturally drawn to other objects surrounded by the undergrowth as I passed several reminders in concrete form that the North Downs Way was not always a quiet place to be. Storage tanks and several pill-boxes were amongst the leftovers from fortification work completed during World War II. Similar work was done in the South Downs too, both providing “stop lines” which would provide defensive capabilities should the Germany army try invading the country; the North Downs being a fallback should it ever be necessary to give up on the South Downs. Whilst focused on the South, several stop lines spread all the way to Yorkshire and Northumberland. Whilst invasion never happened, the Canadian army once had a presence in the area, but most of the fortifications and storage tanks are now quietly left in peace to be taken over by nature or, as seemed to be what was actually happening, to be filled with litter. After a bit the woodland paths tended to merge into each other, especially with my mind being distracted by thoughts of job applications, interviews and the worry that my phone was now curiously quiet. Still at Little Kings Wood a gap in the trees provided another cracking view south and as it was lunchtime I settled down in the grass and took some time out to admire the view, read my book and eat my sandwich. A plastic wrapped affair picked up from Marks and Spencers that morning, I couldn’t help but notice that my “Free Range Egg Mayo and British Ham roll” came emblazoned with a sticker shouting “new recipe!” How you can change egg mayo and ham enough to actually make a new recipe noticeable I had no idea. It just tasted like every other sandwich of that kind that I’d had before in my life. Whatever their amazing recipe innovation was, I couldn’t tell. The trees provided a relaxing walking space but at Ranmore Common I popped out of them once more in order to take in the views of nearby Dorking, before heading slightly north towards Westhumble and some local industry in the form of Denbies Vineyard. Many people think its a joke but the south of England has several vineyards with the climate proving to be generally perfect for sparkling white wines. So well regarded are some of them, that they have a habit of beating Champagne in taste tests. And this was certainly a fine day to be growing the grapes, the afternoon sun coming down and warming the place up nicely. 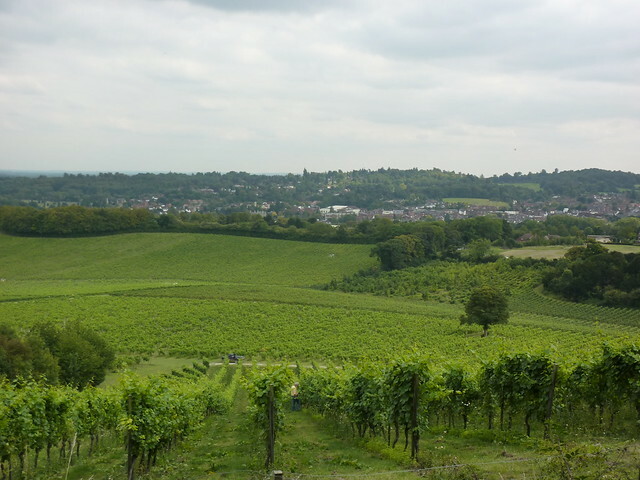 Denbies is the largest vineyard in Britain, accounting for 10% of all vine plantings in the United Kingdom and is a major tourist attraction. As I walked along watching people tending the vines, I was passed by a Land Rover hauled “train” of happy punters being taken round the grounds on one of the tours. 65% of all Denbies wine is sold at its visitor centre, from the very people now admiring the grapes from their seats. There’s a track down to the visitor centre and its associated café and shop, but the North Downs Way wasn’t keen on visiting so instead I took the path slightly further north that would soon head down to the busy A24, and allow me to walk to the nearby Box Hill and Westhumble station. I’d originally contemplated doing a further three miles to Betchworth station, heading up Box Hill itself, but the temptation to hop home on the nearest train was just too much. After all, the route up Box Hill would require a stiff climb up hill before coming down once more. Best to save that for another day, I thought, making my excuses to all who would listen as I walked down Westhumble’s tiny backstreets in order to find my train home. Next time: it’s over the stepping stones and up the steps to Boxhill and beyond. Good to have a blog about trails in the south of England; the vineyard makes it look almost exotic! Are you job-seeking? If so, good luck! There’s actually quite a few vineyards on or near the North Downs Way. Good climate and soil for it apparently. Indeed in taste tests, English Sparkling Wine regularly beats Champagne. But then the French have the brand. Hard to imagine people celebrating with a glass of “North Downs” or “Chalk Hills”. As for the job hunting, well you’ll have to wait for the tale to continue over the next few weeks. I actually walked most of the North Downs Way in 2011 and 2012; just never got round to publishing the tale until now. Did this same stretch today. Beautiful views – especially from St Martha’s Hill. Finished off at the Stepping Stones pub near the station. I love your blog and make a point of reading your notes before walking the routes. Many thanks! First Published: 14 January 2013. Last Updated: 28 December 2014.